As you work with policies and process commissions, you’ll set policies with payees to ensure commissions are split and tracked. To help with this, you can set commission defaults for new policies or for agents when you add them as a servicing agent. Learn how to set commission defaults and how they apply to policies. To edit commissions defaults, users need both view/edit access to agents and edit commission privileges. When both policy & agent commission defaults are active, agent commission defaults take precedence and overwrite policy defaults. 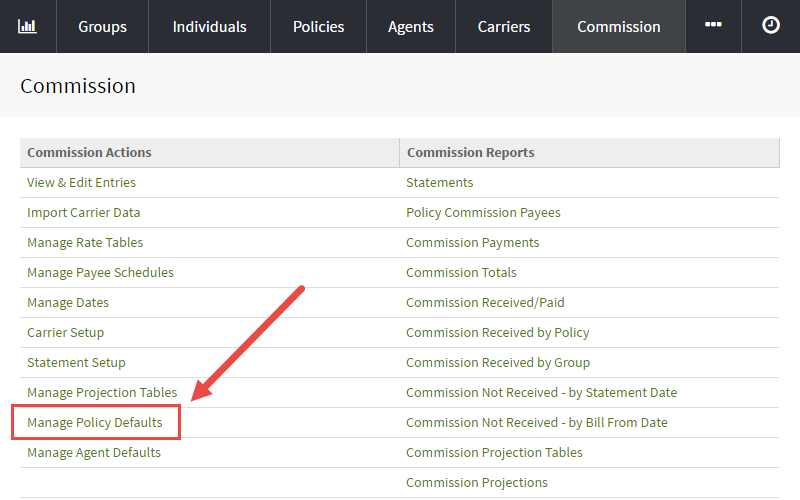 When policy or agent commission defaults are active, they are set regardless of the user. To stop using commission defaults or temporarily pause them, set defaults to inactive. You can set a commission default to apply any time you create new policies. This option is helpful when you pay commissions the same on all policies. 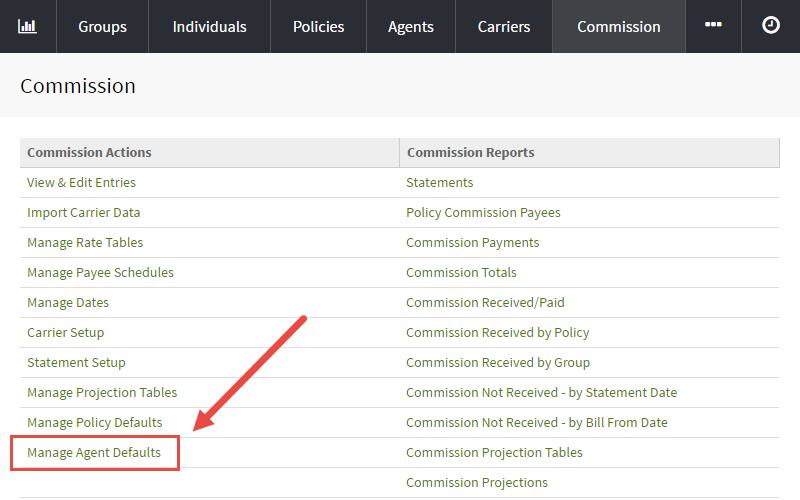 When active is checked, default commissions are set any time you create a new policy. Go to Commission and then select Manage Policy Defaults. Choose your default commission options. Now, any time a new policy is created, commission defaults are set. You can change the policy defaults to inactive when you don't need them. Add Adding a servicing agent to a policy will update the policy with the agent's commission defaults. Change Changing the servicing agent on a policy will update the policy with the new servicing agent's commission defaults. Remove Removing the servicing agent or switching to a servicing agent that does not have defaults will remove the previous servicing agent's commission defaults. Go to Commission and then select Manage Agent Defaults. Find and select the agent you'd like to update. You can view, filter, and manage your agent defaults using search below or the drop down. Choose the default commission options. Save and you’re all set! Now, when the agent is added as the servicing agent on a policy, the policy is set with the agent's commission defaults. Also, you can view or update an agent's commission defaults by finding the agent and then selecting commission defaults under the commissions tab. Tip: You can set up an automated workflow that triggers when a servicing agent changes on a policy so you can be kept up to date as policies are changed. Which defaults are used when I assign the servicing agent as I create a policy? When you add a servicing agent as you create a policy, the servicing agent's commission defaults are used as agent commission defaults take precedence over policy defaults. What happens if I change a servicing agent on a policy? Great question. When you change a servicing agent on a policy, the new servicing agent’s defaults will be set on the policy. If that servicing agent does not have any defaults, the previous servicing agent’s defaults will be removed. How do I create policies and not use policy or agent commission defaults? In this scenario, it's best to temporarily set policy or agent defaults to inactive, create your policy and then reactivate defaults. Are commission defaults set for policies created via API or an import? Yep! When you create policies through an import or API, they are set with commission defaults (policy or agent). Please note, when importing policies, make sure to include both the agent and agency name on the import file.